As families across the country celebrate Independence Day this weekend, many will enjoy tasty barbeques. Family gatherings should be fun, but grilling can be dangerous without proper safety precautions. Each year, an estimated 3,800 people in the U.S. are treated in emergency rooms for burns, carbon monoxide poisoning and other injuries related to grilling, according to the Consumer Product Safety Commission (CPSC). 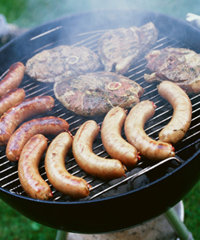 At the start of each season, inspect a gas grill’s hoses for signs of cracking, holes and evidence of animal bites or insects. Replace damaged parts. Make sure the grill is clean before using. Regularly clean it throughout the season as described in the owner’s manual. Keep children away from the grill area. The outside surface of a grill can burn a children’s hands. If a grease fire occurs, turn off the gas grill and use baking soda or a fire extinguisher to put out the blaze. Never store or use flammable liquids such as gasoline near a grill. Check the CPSC website to make sure you are not using a recalled grill. There are several ways to start a charcoal grill, including starter fluid, charcoal chimney starters and electric charcoal starters. Choose one method and become knowledgeable about it before starting your grill. When you are finished grilling, let the charcoals completely cool before disposing them in a metal container. Transport your propane tank to the refill station or hardware store in a standing position. Use a box or order a special carrying case. Do not let passengers hold the tank. Do not do other errands when you are getting your propane tank filled. Never take a propane gas tank inside the refill facility or your home because of the risk for a gas explosion. Be sure the propane tank valve is closed when you disconnect it from the grill. Newer propane tanks have a safety device that will prevent gas flow from the tank when it is disconnected. But it is still a good idea to make sure the valve is closed. When you connect your propane tank to your grill, if you see fog or smell gas, it is a sign of a leak. This means there is a risk for a gas explosion. Stop what you are doing, move your family away from the property and contact your local fire department. Another way to test for a propane tank leak before each season is to open the gas supply valve fully. Apply a soapy solution with a brush at the connection point. If bubbles appear, there is a leak. Try tightening the tank’s connection to see if the leak stops or contact a qualified gas professional.